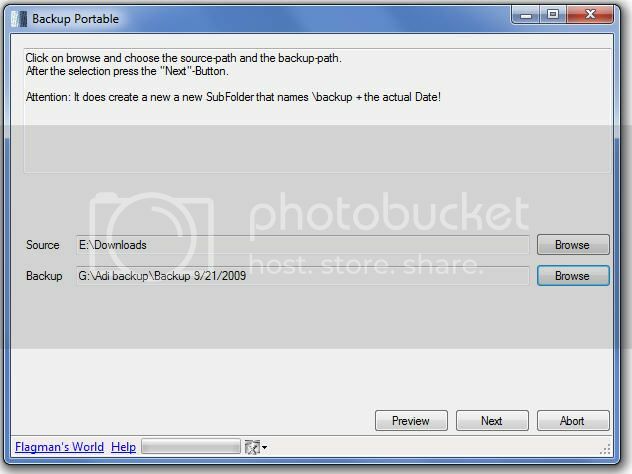 Backup Portable is tiny freeware which allows you to backup any folder of your choice to any location you prefer. Backup procedure is really easy. Everything is done is three simple steps. To backup a particular folder all you need to do is simply press ‘Next’ on the first screen, then on the second screen select the source to backup and the backup destination. Once done, click on the ‘Next’ button. The Backup process will start, once it’s done you can click on ‘Abort’ to close the application or click on ‘Backup one more’ to make a new backup. The software is just 397KB in size and is really light on system resources. It works perfectly on XP, Vista and Windows 7.